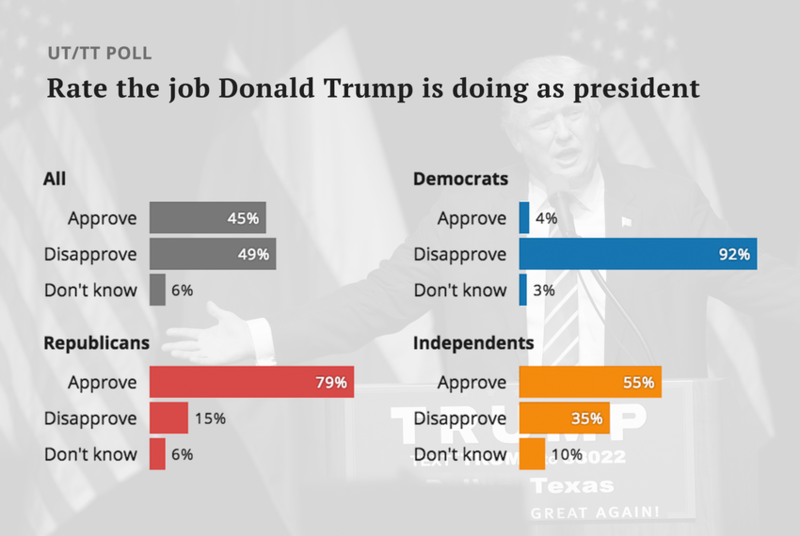 Almost a year after his 2016 election, President Donald Trump's support among Texas Republicans remains robust. Among Democratic voters, it's just the opposite, according to the latest University of Texas/Texas Tribune Poll. In each of those cases, Democratic voters’ antipathy kept the president’s overall numbers below 50 percent. “It’s unified Democratic opposition in anything Trump,” Blank said. “And the Republicans are not as positive as the Democrats are negative. This is one of several stories on the latest University of Texas/Texas Tribune Poll. Also today: Texans rate the top figures and institutions in state politics. Coming Friday: Texans’ views on responses to Hurricane Harvey and on what should top the post-storm to-do list.